Musician, bandleader, legend. Through 40 years and easily as many albums, John Mayall, the venerable pioneer of British blues, has earned his reputation as one of rock ‘n’ roll’s most enduring and influential icons. There is perhaps no greater mentor in the history of rock than Mayall, whose star-studded Bluesbreakers have seen the likes of Eric Clapton, Peter Green, Mick Taylor and Jack Bruce graduate from its hallowed ranks. What Art Blakey is to jazz, Mayall has been to blues-rock. If Mayall’s timely blues grooves made him a local hero, an ear for great sidemen earned him a place in the annals of rock. There was Eric Clapton (“too good to pass up”), Peter Green (“his playing was more than a match for what was required”) and an assorted cast of musical phenoms who continued their trailblazing ways long after parting ways with Mayall. Four decades later, Mayall sees no reason to stop. “The demand is always there,” he explains. JOHN Mayall was born in the village of Macclesfield in England, near Manchester, in 1933. At the age of 12, he learned to play guitar and ukulele. Within a year he taught himself to play piano and harmonica, as well. In 1956, Mayall began gigging around the Manchester area with trad-sounding blues bands, but seven years later, spurred by word of London’s burgeoning electric blues scene, he moved there and formed the Bluesbreakers. He introduced his bass player, John McVie (all of 17 years old at the time), to the blues. The band became a fixture on the local club scene. While the band’s first full-length LP in 1965 earned lukewarm sales, an undeterred Mayall convinced ex-Yardbirds guitarist Eric Clapton to join him. In August of that year, Clapton took a break from Mayall’s group and was replaced by a succession of ax men, including a young Peter Green, who won the job, in part, out of sheer persistence. Clapton returned to the group just as McVie was replaced by Jack Bruce, who, in turn, left to join Manfred Mann two months later. 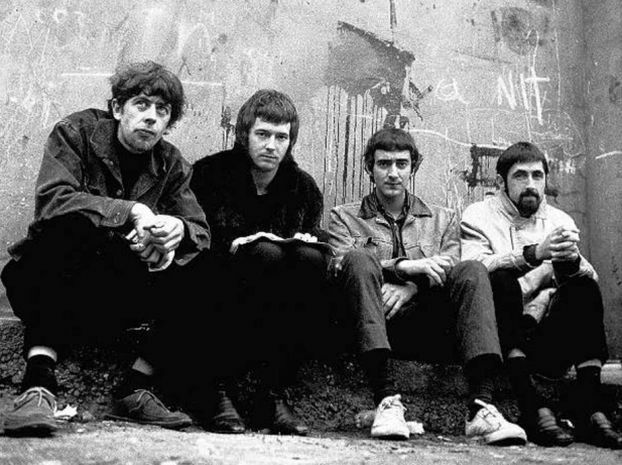 1966’s “Blues Breakers: John Mayall with Eric Clapton” became the band’s breakout album. But just as fortunes began looking up, Clapton quit to join Bruce and drummer Ginger Baker to form Cream. Mayall invited Green back into the fold to fill Clapton’s shoes. Mayall hired drummer Mick Fleetwood in 1967. By year’s end, Green, McVie and Fleetwood left the group and formed Fleetwood Mac. They were replaced by capable musicians, including guitarist Mick Taylor. 1968 started a new direction in Mayall’s music: He pared down his lineup to a four-piece for the courageous “Blues from Laurel Canyon” album, only to be received with mixed reviews. Mayall then dismantled the entire band and initiated an experimental excursion into jazz territory, minus a drummer. He then recommended Taylor to the Rolling Stones as a replacement for Brian Jones. With a striking new format, Mayall relocated to Southern California the following year, and in 1970 the reformed Bluesbreakers (now with Harvey Mandel and Larry Taylor, both formerly of Canned Heat) performed in Hawaii for the first time at the then-named Honolulu International Center. 8:30 p.m. Friday at the Hawaiian Hut, Ala Moana Hotel, 410 Atkinson Drive. Tickets $30 advance, $35 at the door. Call 941-5205.